Seek out this stout now that the weather has cooled a bit. 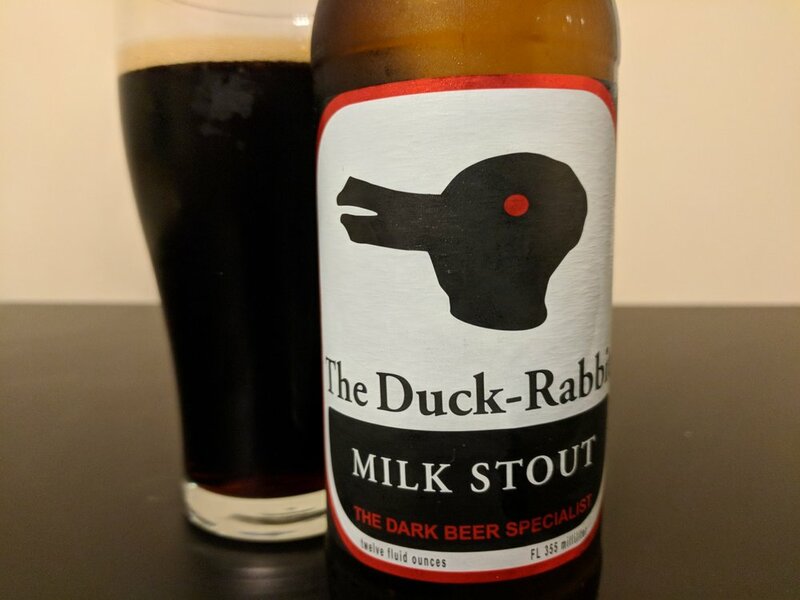 Through the kindness of friendly neighbors, I had the chance to try a North Carolina staple recently in the form of Duck-Rabbit Milk Stout. What can I say? My friends know I like good beer, and they bring it to me when they go out of town. I am blessed. Duck-Rabbit is a family-owned, 20-barrel brewery located in Farmville, such as the iconic milk stout, an amber, a brown ale, American black ale and seasonals such as a barleywine and Rabid Duck, an imperial stout. If you haven’t come across a beer yet from this brewery, you’ll know it by the distinctive red and black logo that, depending on your perspective, may look like the silhouette of a duck or a rabbit. Focusing on “dark” beers (is that a style? ), the brewery’s milk stout is a perfect representative of what’s brewing down in Farmville, with a jet black body and beautiful aroma emanating from the medium, tan head that offers up milk chocolate, light roasty notes and even a hint of caramel – kind of like an intense candy bar. I was quickly hooked, and I hadn’t even taken a sip yet. Naturally, I wasn’t disappointed by this creamy, medium-thick brew from the use of lactose. The chocolate isn’t quite as forthright in the flavor, but the remaining sugar after fermentation offers a bit of sweetness. For balance, there’s a mild roast quality that helps give the beer a dry and slightly sharp finish with a chocolaty flavor that lingers on the palate. What more can be said? Duck-Rabbit’s milk stout is its annual best seller for a reason: It’s a good version of the style, nothing fancy or out of bounds. It’s just a good beer. I have to admit that I shared one with a friend, but I kept the rest for myself. I might put one back for cooler weather, and I’ll certainly keep my eyes out for other beers from this North Carolina brewery. Duck-Rabbit distributes through much of the southeast and as far north as Pennsylvania. You can find the milk stout in bottles and on draft.